For subscribers to Developing World Bioethics, there is an interesting online article comparing the responses of the international community to the tsunami in South East Asia in 2004, and to the AIDS epidemic in developing countries. According to the authors, the two responses were unethically different. The tsunami cost 273,000 people their lives, and ten billion dollars was pledged for the recovery efforts. In the same year, 3.1 million people died from HIV/AIDS, and there is a predicted 18 billion dollar shortfall between 2005 and 2007. The authors brush away any attempt to rationalize the differences between the two responses: whatever differences there are between a terrifying natural disaster and a deadly epidemic disease are not ethically relevant differences, and cannot justify why the tsunami relief effort received so much human, material and financial support while the effort to treat and control HIV/AIDS is painfully underfunded. Maybe some of the differences can be explained like this. 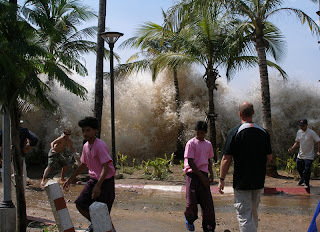 The tsunami was a concrete one-day event, even if its knock-on effects will be felt for quite some time. With HIV/AIDS, you are looking at a titanic struggle over generations: unless cures are found, all those who are HIV infected may need antiretroviral treatment and medical care for the remainder of their lives. Since no effective vaccine has been found, much of HIV epidemic control is about increasingly convoluted ways (condoms, microbicides, abstinence, circumcision, fidelity) of preventing people from getting the virus, and therefore found vast resources have to be devoted to saving abstract, 'statistical lives.' The chronic character of AIDS care and the abstract character of HIV prevention may help make AIDS less attractive to donors than a tsunami. But the more fundamental issue is: how rational are communal ethical responses to disasters and crises, and how rational can we reasonably expect them to be? Consider the humanitarian responses in the United States in the wake of 9-11: vast resources were donated and allocated for an event that cost the lives of about 1% of the people who died in the Asian tsunami. Was this wrong? The donations of blood, time and money were at least partly expressions of grief and feelings of powerlessness, and not the result of an economic calculus. Can we be expected to make rational calculations about how much (or how little) should be spent on a given crisis, relative to other crises, in the general scheme of things? Should a panel of experts -- a kind of international crisis management team -- be convened to objectively allocate levels of resources to disasters, on the basis of dollars per death?